Liam Jurrah became angry, on the night of March 7 last year, when he heard people calling his name, saying that he didn’t respect anybody, that he didn’t want to know his old man and his grandfather. They were saying, “all you want to do is to come here and be with your mother’s family”. He was angry but he didn’t have “any fight with no-one”. 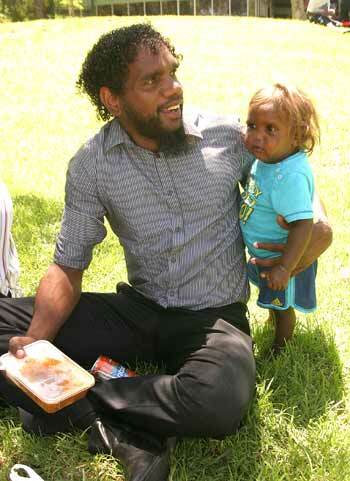 At left: Liam Jurrah with niece Johnisha White at the lunch break today. It was with these words that he put his finger on the heart of the matter during his hour and a half long interview with police last March 8. A recording of the interview was played to the jury in the Supreme Court in Alice Springs this morning, on the sixth day of Liam Jurrah’s trial for allegedly causing serious harm to Basil Jurrah, his cousin. He has pleaded “not guilty”. In the interview Liam Jurrah repeatedly told police that Basil Jurrah was already on the ground when he got to where he was assaulted. He said he, Liam, was armed at this stage with a crowbar and small stick (broken off a couch) for “self-defence”. He had picked up the crowbar in front of House One. He said that at first he hadn’t known it was Basil; then he was distracted by seeing his “little nephew” staggering, bleeding. He jumped the fence to get to him and carried him away from the scene, he said (again, repeatedly). He repeatedly said that he was not armed when he first went to Little Sisters camp. Indeed he said he attempted to disarm his cousin Josiah Fry, who he said had an axe and was trying to fight with Lemiah Woods. However, when Const Aila put to him that witnesses had said he was armed at this stage with a small axe and a crowbar, he said he was carrying something shaped like the number seven, that looks like an axe. He could’t say exactly what it was but said it was part of a machine. At another point, he said he had the crowbar in order to “pretend” that he was going to fight. He also told police he and his companions had consumed a large amount of alcohol on the night. He said they were a group of five, drinking down the creek at the back of Old Timers, under the bridge. They started at about 4pm, drinking VB, a bottle of rum and a bottle of Smirnoff. After they finished they had a feed, then bought more grog – “the same thing” – from AJ’s (at Heavitree Gap). This time they finished around 10pm. Describing his state by this time, he said : “I knew what I was doing.” It was when they were heading home that his cousin, Josiah Fry, “rushed” towards Little Sisters. He said Josiah found an axe by the railway line. He spoke of being frightened for himself, not wanting to get hurt, being worried about his body especially while he was on a break from the Melbourne Football Club, not wanting to get into trouble with police, of having a cut on his foot, and later of being worried about the whereabouts of his wallet and mobile phone. He also spoke several times about telling people to stop fighting, to calm down, of thinking to himself, “This is not right”. At one point he asked Const Aila if Basil Jurrrah had made a statement. Later Const Aila put to him that Basil had said that Liam had hit him. Liam denied it. Const Aila repeated the allegation, that he had hit Basil with a machete on the head. Liam said he didn’t: “I didn’t have any machete.” Const Aila put it to him that Basil had said he had hit him on the right thigh four times. “No,” said Liam. Const Aila said that Basil had said the attack lasted seven (or possibly several) minutes, that Liam Jurrah and Christopher Walker had hit him “heaps more times”. “No,” said Liam Jurrah. The trial continues. The Crown case may conclude as soon as this afternoon. The court heard from a final civilian witness this afternoon, Douglas Watson. Speaking through an interpreter and at all times averting his eyes from both the prosecutor and the defence counsel, he gave evidence that he saw Liam Jurrah hit Basil Jurrah twice with a machete. Constable Darren Cox also gave evidence, confirming that on the night Essau Marshall had told him that Christopher Walker had hit Basil Jurrah over the head with a machete, and that Liam Jurrah was also involved in the attack but he didn’t know exactly what he had done. Const Cox said it was a clear night with a full moon, so visibility was good. In relation to the testimony of witness Philomena White, who said she saw the attack on Basil Jurrah from inside the house, Const Cox said, under cross-examination, that she had no information to offer about what people were wearing at the time of the fighting. He was also questioned by first the prosecutor, then defence counsel, about an inconsistency between his notes from the night and his sworn statement. His notes had Philomena White saying that she saw Liam Jurrah hitting Basil Jurrah with a large knife, while his statement, made later during the same shift, says she said he hit him with an axe. Const Cox said he hadn’t noticed the difference between the two. Senior Constable Sean Aila, who led the police investigation, will be recalled in the morning for further cross-examination. The Crown is then expected to conclude its case.